There are no firm guidelines for how often to bathe a dog. The quality and texture of the dog’s hair (whether it’s long, silky, curly, smooth, or wiry) will determine how much dirt it collects and how frequently the dog should be bathed. Your dog’s lifestyle and activities will also influence how often she gets dirty and needs a bath. If you own a dog with special coat requirements, you may wish to consult a breeder or a professional groomer for specific recommendations. The usual reasons for bathing a dog are to remove accumulated dirt and debris, to facilitate the removal of dead hair at shedding time, to eliminate doggy odor in dogs with oily coats, and to improve the appearance of the coat. Routine bathing is not necessary for the health of the coat or the dog. In fact, frequent bathing can rob the coat of its natural sheen and make it harsh and dry. For most dogs, regular brushing will keep the coat and skin in good condition and eliminate the need for frequent baths. I recommend you bathe a dog with normal skin once a month with dog shampoo or human baby shampoo. If you want to bathe more often than that, use a soap-free or moisturizing shampoo to prevent the skin from becoming dry. Teach your dog to associate bathing with things he loves. Many dogs find bath time unpleasant—and who can blame them? It involves being restrained, soaked with water (which some dogs really dislike), slathered in scented suds and handled in various, sometimes uncomfortable ways. However, you can help your dog learn to tolerate—and maybe even enjoy—bathing. The secret is to teach your dog that bathing is always followed by things he loves. If your dog learns that bath time reliably leads to wonderful stuff—like special treats, brand-new chew toys, the start of a favorite game, a walk in the park or dinnertime—he’ll soon learn to feel much better about it. And if he feels much better about getting a bath, he’ll behave better too, which will make bath time easier for both of you. So whenever you bathe your dog, help him to associate bath time with things he enjoys. Right after putting him into the tub, give him a tasty treat, like a small bite of chicken or cheese. If your dog seems nervous about running water, give him a treat right after turning on the tap. After toweling him off, immediately invite him to play a rousing game of tug or give him a handful of his favorite treats. With repetition, your dog will probably decide that getting a bath is fun, not frightening or stressful. If you get your puppy used to regular bathing now, bathing him as an adult will be a breeze. Follow the guidelines above with your puppy. The same ideas apply. Try to focus on associating bath time with treats, toys and games, and on slowly and gently introducing your puppy to the sights, sounds and sensations of bathing. 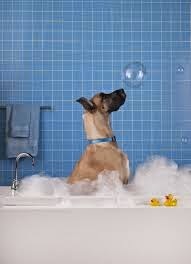 Bring some toys into the tub, encourage your puppy to play with the bubbles and make the bath seem like playtime. It’s also worthwhile to get your puppy accustomed to other kinds of grooming and handling. Take time every day to touch your puppy all over his body. Handle his feet and toes, open his mouth and look at his teeth, examine his ears, brush his fur, carefully trim his nails, lift and handle his tail, and gently restrain him in your arms for a few seconds at a time. Immediately after touching or handling, give your puppy his favorite treat or play with him. Just like with bathing, your goal is to convince your puppy that people restraining and handling him result in good things. If you can build your puppy’s positive feelings about grooming when he’s young, handling and grooming will be much easier for you both throughout his life. Prepare your workspace. Gather all the items you will need, towels, dog shampoo, dog conditioner (if needed)and sponge and lay it out so it's close at hand when needed but not in the way of getting kicked and splashed by the dog. Pull over the hose or turn on the water for the bathtub. When finding the right temperature, keep in mind that dogs have more sensitive skin. Keep it a lukewarm to warm temperature. Find a helper if you think you'll need one. Brush the dog's coat thoroughly. This is a good time to inspect for any skin/coat/health issues while relaxing and showing your dog some love. If you spot any ticks, you may want to see a vet to get it removed or remove it yourself. Pick a good shampoo. If your dog scratches a lot, decide if the scratching is from parasites, allergies, or simple skin irritation. If your dog is suffering from parasites, pick out a good flea or problem specific shampoo at a pet store or retail store. Otherwise, select a mild shampoo, or make the shampoo yourself, as many dogs are allergic to shampoos that contain chemicals. Some general dog shampoos are formulated with oatmeal to help reduce general irritation. If you have a puppy, check to make sure that he is old enough for the shampoo that you have chosen. The key to reducing general irritation is to rinse your dog well after the bath. You might get a snap-on hose attachment designed to help you rinse your dog thoroughly. These snap-on attachments are available for both a sink (for the small dogs) or for the shower for larger dogs. Always rinse the dog with clean water, no rinse cups needed. Some of the snap-on attachments have nice long hoses and sprayers so you can simply hold the sprayer upside down under the dog to rinse the belly. Your dog will think it is at the spa! If it is during the summer, you may want to just wash your dog outside with the hose. Get your dog's coat nice and wet, then apply the shampoo. Start with the head. Make sure to massage shampoo into all of his creases, or rolls, like under his front legs and neck. For best results, use your thumbs or fingers to massage in a circular motion. Be sure to thoroughly scrub areas that are always seeming to get dirty. Wash the head and face. This is very important if your dog has or has had flea problems. It will wash them on to the body and therefor make it easier to get rid of as many as possible.If your dog shampoo is not marked "will not sting eyes," Get a warm damp flannel and gently rub his face and under his chin. Use warmer water for this, as it also shocks any fleas, also aiding in getting rid of them. Make sure you DO NOT get shampoo in your dogs eyes, nose, ears, or mouth. Inside ears is a favorite hiding place for fleas, but breeds with big ears (Shih-tzu, Bloodhound, Maltese, etc. are prone to infections if their ears are wet inside. For these dogs, wash inside only with a slightly damp washcloth, or use damp cotton swabs (try not to use Q-tips, which may harm your dog's ears). Keep the shampoo on your dog for as long as the bottle calls for. Rinse your dog until the water from his fur runs clear. Then rinse one more time. If your dog shies from rinsing his face, use your hand to bring water from the faucet to his face repeatedly to rinse. You can also use a wet washcloth and wash off the water with small circles. 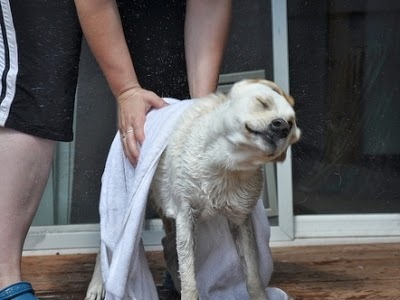 Get a small or big towel, lay it over your dog's back, and rub your dog dry. Make sure you dry the inside of his ears also. A dog's instinct is to shake itself when wet, though, so be careful. In the winter, or for small dogs almost all the time, lay a dry towel on the floor and use a hair dryer and dog brush to dry and brush your dog. You may also want to spray some perfume for dogs on your dog. You can get this at your regular dog store. Be careful with the perfume; some dogs may be allergic, so consult your vet or a professional groomer before you use it on your dog. For dogs prone to ear infections, use 2 drops of a vet-supplied rinse that will help dry the ears. A dog is not washed properly until the hairs inside his ears have been pulled out; this is especially true of dogs prone to ear infections. If you’ve got a medium-sized or larger dog, you can bathe him in the shower. It’s much easier for dogs to step into showers without tubs. If it’s warm enough, try bathing your dog outside. You can use a plastic kiddy pool or a regular hose. If your dog loves to chase a stream of water coming from a sprayer, you can incorporate that game into bath time. Spray water into the pool and let your dog jump in to chase the stream. After a minute or two of fun, shampoo and rinse your dog. Then, after the bath, you can play with the sprayer again to reward your dog. If you have a small dog, you can bathe him in a kitchen or utility sink. You won’t have to bend over, and your dog won’t have to get into a big bathtub, which might scare him. You can use the kitchen-sink sprayer to conveniently wet and rinse your dog! 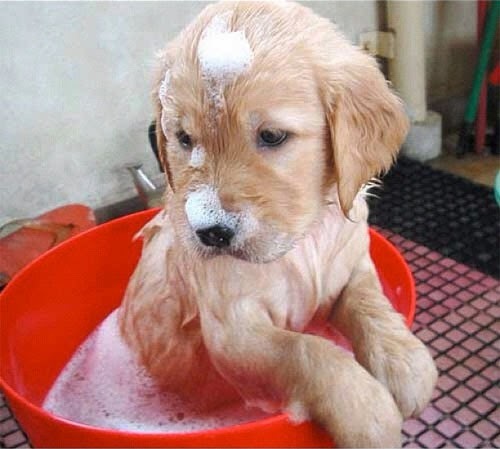 You can purchase a special tub made specifically for bathing dogs, such as the Scrub-a-Dub Dog Tub. Dog tubs usually include a leash clip to restrain your dog, a hose and a showerhead attachment or sprayer. Some are designed to make it easy for your dog to get into and out of the tub. Many are portable, so you can bathe your dog anywhere you like. Some pet-care businesses, such as boarding kennels, day cares and groomers, offer do-it-yourself dog wash stations. Usually, you just have to bring your dog. The business provides shampoo, conditioner and towels. The self-serve tubs include sprayers or hoses, and they often have ramps, so your dog can easily walk into the bathing area. If your dog really dislikes bathing, only bathe him when absolutely necessary. Instead of getting him wet, brush him daily and use a damp cloth to wipe stubborn dirt off of his fur and paws. You can also try using a powder, spray or foam “dry shampoo” on your dog. Just apply the shampoo to your dog’s coat and then brush him. No rinsing is needed. Some dogs are fearful or aggressive when their pet parents attempt to bathe or handle them. Signs of fear or aggression include trembling, trying to get away or hide, drooling, panting, whining, freezing, staring, growling, snarling, snapping and, of course, biting. 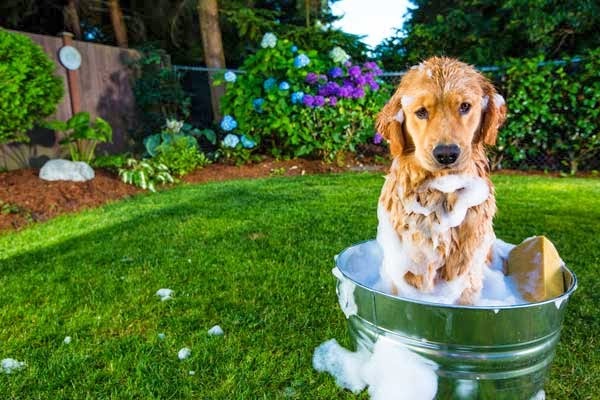 If your dog does any of these things when you try to bathe him, you need the professional help of a Certified Applied Animal Behaviorist (CAAB or Associate CAAB) or a veterinary behaviorist (Dip ACVB). If you can’t find one of these professionals in your area, you may be able to find a Certified Professional Dog Trainer (CPDT). If you elect to hire a CPDT, be sure to determine whether she or he has professional training and experience in treating fear and aggression, which isn’t required for CPDT certification. Please see our article called Finding Professional Help to locate a qualified expert near you. Do not physically punish or yell at your dog if he resists bathing. Doing this will only make him feel worse about the activity, and it will probably worsen his behavior. Do not force your dog to submit to bathing if he’s obviously frightened. Contact a professional behavior expert for help instead.